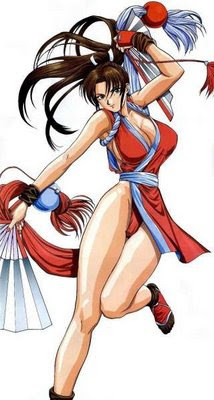 Mai Shiranui is one of the most popular female fighters in video games. Could it be her personality? Her fighting skills? Or her outfits? Take your pick. There are several versions of her for MUGEN. I doubt that I have all of them. Her moves are falshy and always interesting to watch...especially for adolescent boys such as I was when I first encountered the Character. The Street Fighter craze had started and companies like SNK were attempting to make their characters stand out. Mai certainly does stand out.